Some technical and not so technical stuff about my work, open-source and other projects. Reviews of recent technologies, tips and tricks I use. "In-depth" meaning that you get to see some circuits here. But we'll get to that, let's put some background first. Disclaimer: I'm not affiliated in any way with any trademark holders mentioned nor am I any kind of hardware engineer. 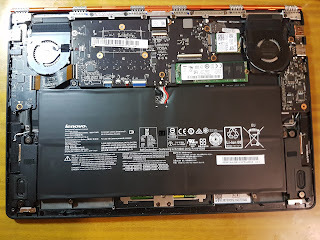 A few months ago I bought this laptop for mainly three reasons: cutting-edge hardware for ultraportables (including 512 GiB SSD, and especially 16 GiB RAM, something that leading competitors have yet to start including — RAM is not upgradable so it's important), normal keyboard without counter-intuitive keys (very rare among ultraportables), and super-cool wristwatch hinge, used also for ventilation which means that nothing usually blows hot air to your laps). And all that for price similar to the price of competitor laptops with the same chipset/cpu (keep in mind that even slower large SSDs are still quite expensive). I've found out that it's quite quiet for something having fans at all and quite powerful. I would very much prefer something with two SSDs so that I can RAID-1 them, but that's not very common and wasn't critical for me. you'll have to dual-boot to update bios firmware. I usually just install Win10 to my swap partition, do what I need, wipe it, and use as a swap again. Anyway, externals and software are reviewed on many other resources so I'll just stop here. Yesterday, I was working late and, when getting up from my desk, spilled about 100 mL of Corona Extra with lime (say what you want, I like it) on the keyboard. 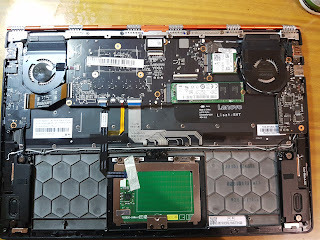 After the usual turning over and wiping to make sure nothing gets to deep inside (and finishing the bottle), I started disassembling to wipe and clean everything inside, assess damage, and clean the keyboard separately. It's not the first laptop I had repair after spillage (the first of my own though) so I new that first aid must come prompt. If you're already bored, summary is that I'll probably need a new keyboard and a new DC-in jack cable. For everyone else, some photos follow. This is what you see after you unscrew ten T-5 screws and struggle with hooks a little. 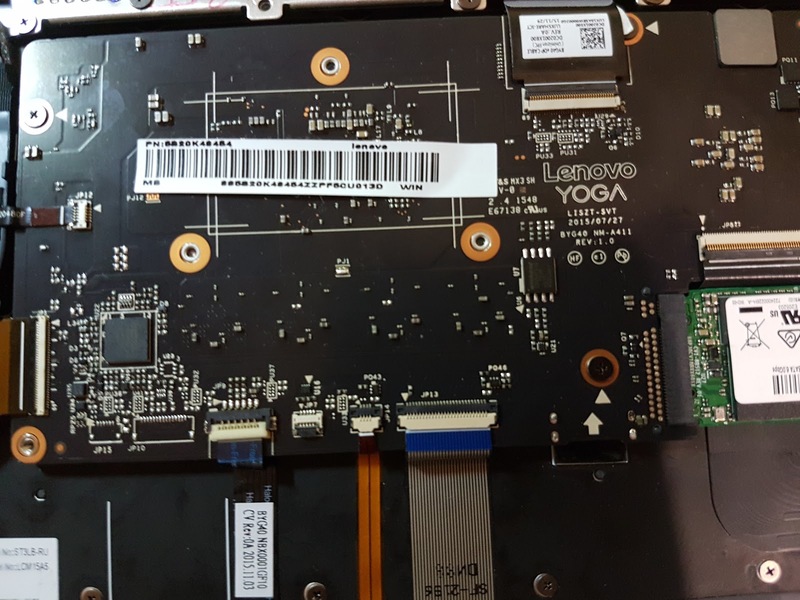 Notice that motherboard does not carry any external ports and both I/O boards can be replaced separately (damage from electric discharge or some such will hopefully be limited to them, keep repair costs relatively low). DC-in has a separate cable which I prefer in my laptops, because they tend to break from time to time and I both don't know how to and don't want to solder-in any parts into expensive circuit boards. In this particular case, however, there a minor catch. Unlike other ports, to remove that cable you have to pull upward, not away. Because I haven't studied the maintenance manual first and didn't look to close as it was an emergency situation I pulled in the wrong direction a little to hard and destroyed the connector. Now I'll have to wait while a replacement arrives. Battery is generally the first thing you have to remove when dealing with spills. 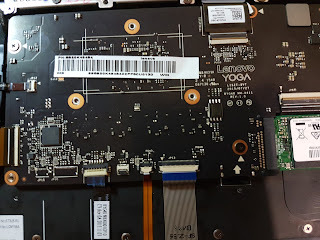 This one can be remove relatively easily but cable is connected to the motherboard from the bottom making it slightly uncomfortable to remove or replace. I didn't stop to make photos while I was cleaning, and won't go further until I have a replacement keyboard (at which point I might post some additional photos here). But you can see part of the keyboard and note that it has some tape on it and is connected by a lot of screws. The tape, unfortunately, doesn't make it even slightly spill resistant even though it's a very simple an very important addition (some competitors do that, I'm not pointing to Acer R13 R7). It's not like there's any air circulation through the keyboard anyway. 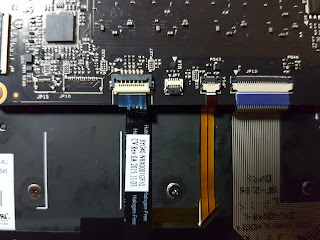 Pretty standard M.2 for SSD and PCI-e for wireless card. Overall, my impression is very positive, some things might be not ideal but it's a solid piece of hardware that will probably serve me well for years... Once I fix it this time and stop spilling stuff on it. JP7 looks like a fan port (I'm totally guessing, could be anything). JP15 and JP10 have nothing soldered into them but I'm very curious whether I can connect USB or PCIe or at least GPIO or something to any of them. If only there were any test for that or some document. Maintenance manual doesn't say anything. Maybe I can find some spec sheet if I use info printed on motherboard? Or maybe I should just go and ask Lenovo. 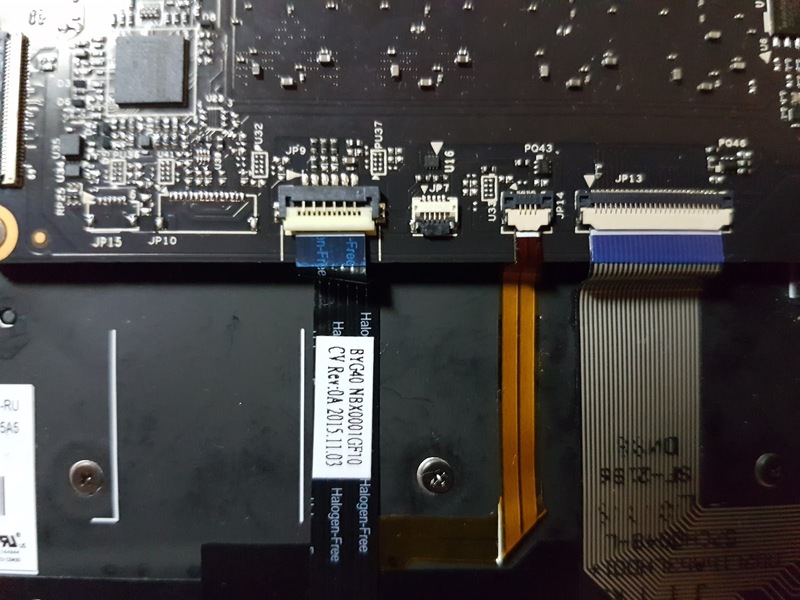 Internal USB port would be very appreciated even though it's too thin for almost any additional device to fit inside (I'd try to put a hardware RNG circuit there, or something). By the way, keyboard is still acting up even after I cleaned it thoroughly with alcohol and let it dry. So I'm going to replace it and get myself a new wireless keyboard, luckily, this laptop can stand on desk in a tent mode freeing space for an external one. I decided that it's time to try some mechanical one, so I might compose a review of that as well in a couple months.